Please select your fencing type from the drop down menu and a picture will be displayed of the fence you choose. Please note the bronze is a lot more brown tint to it than shows in the picture. It just seems difficult to show on the photograph due to camera lighting. When you buy a pack you will be buying a pack of three of these panels. 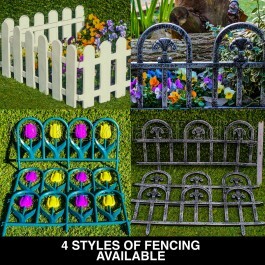 So many uses to pretty up your garden- caravan plot or I have even seen them used to surround grave plots. Ground spikes makes it easy to edge and create pathways in your garden, either straight, curved. Just click together to extend your fence. Maintenance free, no need for any paint or varnish and will last you years. White - Each Length = 60cm Long - Hieght = 29cm No Spike.Total 3 pack length = 1.8mtr.--- No Ground spikes makes it easy to edge and create pathways in your garden, Just click together to extend your fence, level and hold striaght with your soil or gravel. 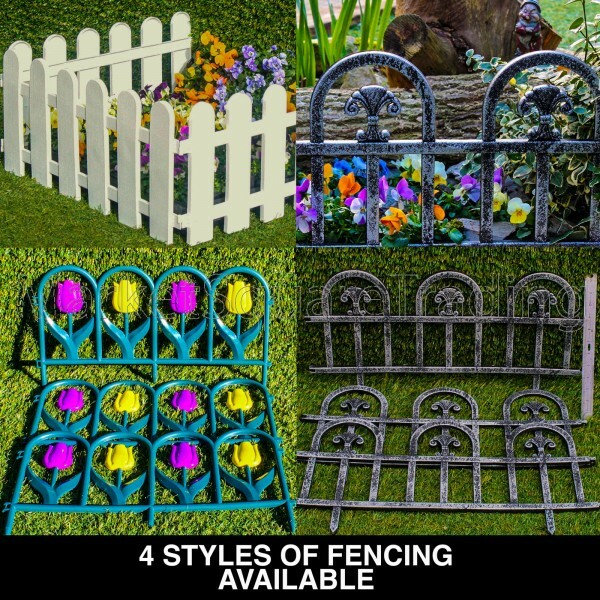 I Truely don't know how long these will be in stock at this low price so please make sure you buy enough to finish your edging length when you order. Please note that the white can be used as small animal enclosure by adding timber to the base as in the photos. Please note that on the enclosure i have used 2 packs of 3 pieces.